Recognized worldwide for its novel designs with sectionals, Natuzzi has become one of the principal Italian manufacturers of leather upholstered furniture. Headed by Pasquale Natuzzi who remains Chairman and Chief Designer, Natuzzi provides superior craftsmanship by blending the traditional Italian practices of furniture manufacturing with technological innovations. Natuzzi sectionals have a quality that only comes from decades of perfecting. Each model of sectionals offers a wide range in styles that makes Natuzzi an easy choice for any décor. From modern and contemporary designs to more classic features, there are options that will appeal to every palette. Built with the latest in cutting edge technology, Natuzzi has succeeded in mixing the power of surround sound while relaxing in comfort with the B641 sectional. A modern influence gives this sectional a sleek look that works well in a contemporary setting. But it is the speakers that have been placed inside the actual sectional that sets this sectional apart from all others. Experience a home theatre that brings you to a whole new level in high tech features. With its rounded corner frame, adjustable headrests and footrests the B641 sectional is catered to giving comfort to family and friends. Assortments of configurations are offered within this model such as armless chairs and loveseats to arms that come with cup holders and surfaces for snacks. Design the sectional that is a perfect fit for your life. Available in an extensive amount of Italian leathers that are known for remarkable durability, choose between categories that are treated or natural. Gorgeous large hides in dozens of colors are ready to be browsed. If fabric is more fitting for your needs Natuzzi has plenty of options. 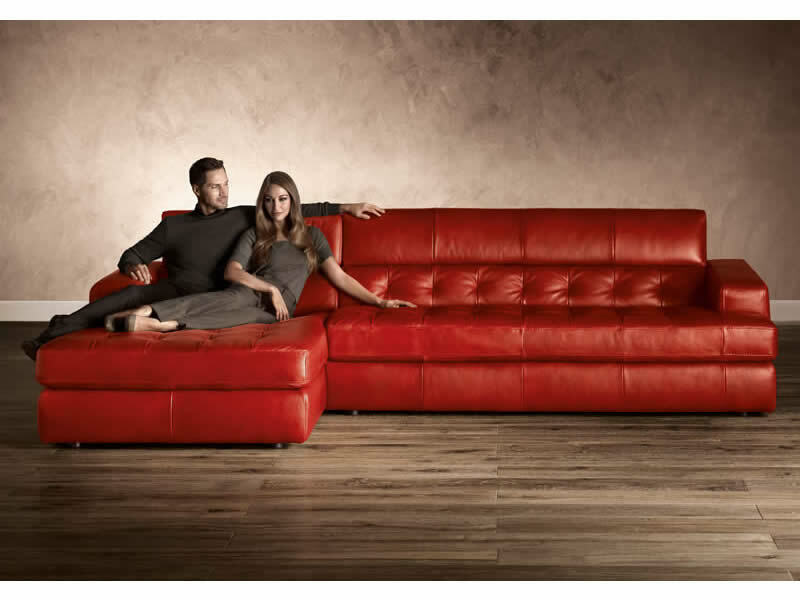 For a more traditional fashion Sectional A855 will have you covered in style and comfort. This sectional makes use of a vintage feel while being updated with modern technology. Choose between a recliner, chaise sofa or loveseat to make your sectional. Finish off the look with an ottoman from the same collection. Natuzzi believes in smart designs starting from the body of the sectional, Natuzzi builds its products from the inside out. Frames are made from solid wood while molded plywood, Plexiglas and steel are added for strength. Masonite is then covered all over the frame to prevent any breaks while squeaks and rust are eliminated by not using any metal. Foam is then layered throughout the frame to further protect while industrial strength webbing creates a suspension system that is certified European technology. Down to the sophisticated yet delicate wooden spool feet, Sectional A855 will complete the look of a classic styled space while delivering the most current technology to maximize comfort. Every seat within a Natuzzi sectional has computer gauged tension, creating furniture that is not only quiet and flexible but will last for years to come. Natuzzi engineers its furniture with only the best materials that will bring you and your loved ones comfort and peace. For years Natuzzi has provided its consumers with the quality of furniture they need. They do this by listening to what people want and enjoy for daily life. Sectionals designed by Natuzzi do not just give the best in quality; they give you styles that are top current trends all over Europe. Your home is a reflection of you, fashion forward in design while using all the cutting edge technology.